Do you want that battered? Finding an iPad mini right now is like trying to find oil; they’re out of stock almost everywhere — at least where I live in the United Kingdom. Apple retail stores are getting them in, but they sell out in no time at all. The only option for most customers, then, is to order online and endure the lengthy wait for delivery. That’s what Reddit user ‘vinlays’ did. And after a painful five-week wait, FedEx delivered the iPad mini to his door. That’s a picture of it above. The device received such a beating en route to its new home that not only was the outer packaging damaged, but the iPad mini as well. Look at this thing — I can’t imagine what kind of damage it must have gone through to end up in that condition. 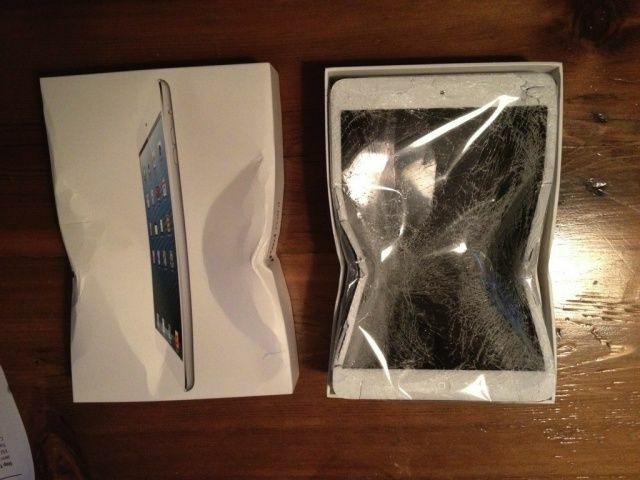 I know I’d be pretty pissed if my iPad mini turned up like this — especially after waiting five weeks for this. I only hope that Apple bends the rules in this case and gets ‘vinlays’ a brand new iPad mini sent out right away.